Power system stabilizers are widely used to generate supplementary control signals for the excitation system in order to damp out the low frequency oscillations. 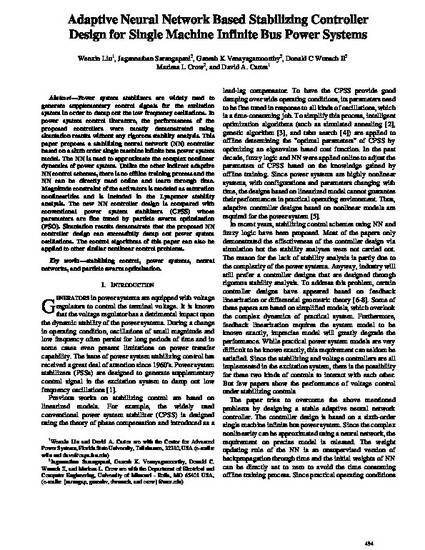 In power system control literature, the performances of the proposed controllers were mostly demonstrated using simulation results without any rigorous stability analysis. This paper proposes a stabilizing neural network (NN) controller based on a sixth order single machine infinite bus power system model. The NN is used to approximate the complex nonlinear dynamics of power system. Unlike the other indirect adaptive NN control schemes, there is no offline training process and the NN can be directly used online and learn through time. Magnitude constraint of the activators is modeled as saturation nonlinearities and is included in the Lyapunov stability analysis. The new NN controller design is compared with conventional power system stabilizers (CPSS) whose parameters are fine tuned by particle swarm optimization (PSO). Simulation results demonstrate that the proposed NN controller design can successfully damp out power system oscillations. The control algorithms of this paper can also be applied to other similar nonlinear control problems. © 2007 Watam Press, All rights reserved.